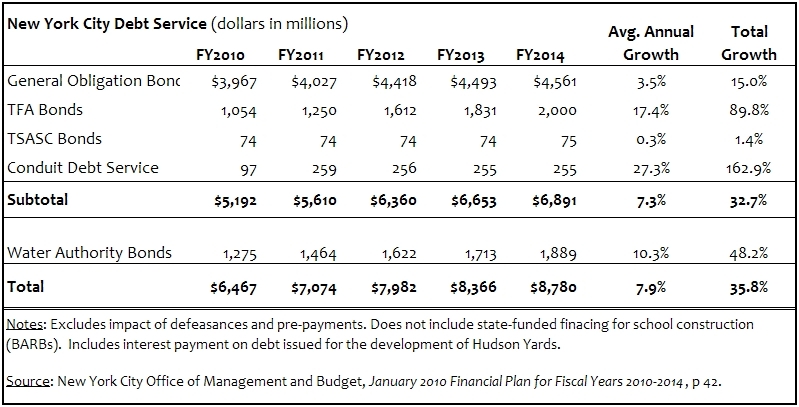 Given the fiscal pressures on the City, what does Mayor Michael Bloomberg plan to do to cut debt service? Debt service, the payment of interest and principle due on long-term borrowing, has been growing rapidly under his tenure. Since it is tied to the size of the capital plan, it can only be controlled by reducing the level of capital investment that is supported with borrowing. It is unclear from the City's latest financial plan whether the City will be successful in making such cuts. Debt service is a major item in the City's budget. In order to get a sense of the City's true liabilities, it is important to examine costs before prepayments and other defeasances, which may artificially alter the amount the City pays in the budget in a given year. In the current fiscal year, debt service totals $5.2 billion - or 12.4 percent of all city-funded spending. When, as shown in the table below, $1.3 billion in costs serviced by the Water Authority to support environmental protection projects are included, debt service totals $6.5 billion. This amount equals the budgets of police and fire departments combined. Debt service is projected to rise 7.9 percent on average from fiscal years 2010 to 2014 - a faster rate than almost all other items in the budget. Direct city debt service is projected to grow by one-third to $6.9 billion; as a result, one in every ten dollars of revenues received in fiscal year 2014 will be allocated to debt service. Total debt service costs will grow to $8.8 billion - over 35 percent more than current costs. Most of this increase will be driven by sharp increases in the debt service costs of the Transitional Finance Authority (90 percent) and the Water Authority (50 percent), which are both backed by specific revenue streams (the personal income tax and water and sewer user charges, respectively). Increased debt service is the direct consequence of a capital program that has grown vigorously. Capital commitments, which are registered when the City enters into a contractual agreement to undertake work or procure assets, totaled $24.8 billion for fiscal years 2002 to 2005. 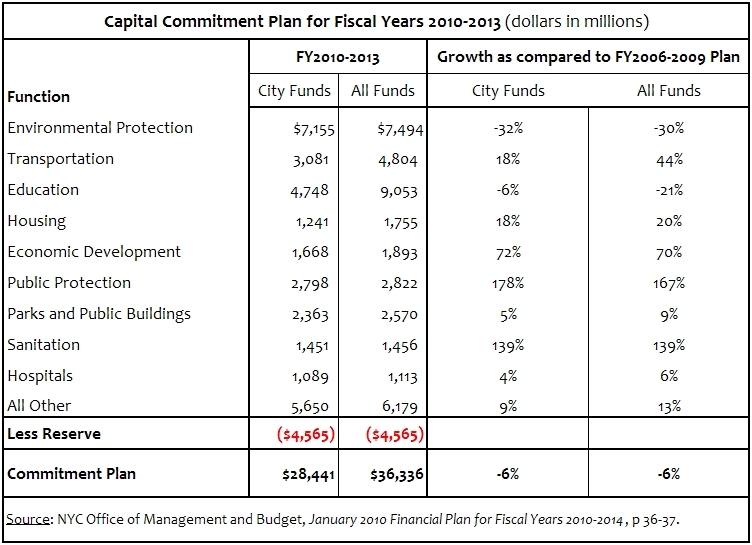 As shown in the table below, the City's capital agenda boomed along with its economy, expanding to $38.6 billion in commitments for fiscal years 2006 to 2009. Increased capital spending was driven primarily by two factors. First, the State agreed to match the City's financing for school construction, resulting in a doubling of the education capital program. Second, the City expanded its total investment by almost one-third over the previous plan. In particular, city-funded expenditures for environmental protection grew almost 50 percent, mostly to fund federal mandates, to replace aging infrastructure, and to support various expansion projects. This increased city investment reflected not only an expanded commitment to infrastructure, but also rapidly escalating construction costs stemming from a regional building boom. 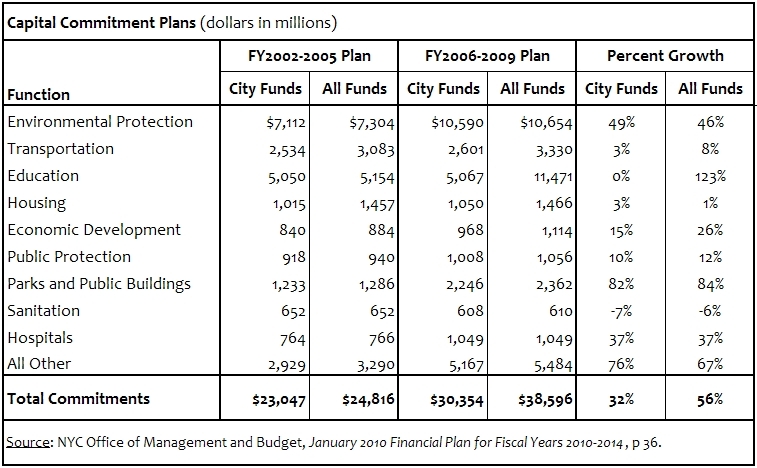 Although not shown here, when actual capital commitments are indexed to account for these increased costs, city-funded spending in several areas - including transportation, education, housing and sanitation - actually decreased by more than ten percent between the 2002-2005 and 2006-2009 periods. However, substantial increases in parks and public building (56%), environmental protection (30%), and hospitals (23%) resulted in an overall increase of 14 percent in city-funded spending on an indexed-adjusted basis. In response to deteriorating economic conditions, Mayor Bloomberg announced substantial reductions - of 20 percent in May 2008 and 30 percent in January 2009 - to planned capital spending. Nevertheless, commitments in fiscal year 2010 are expected to reach a record high: $14.5 billion. The updated commitment plan for fiscal years 2010-2013, released with the preliminary budget in January 2010, is $36.3 billion – just 6 percent less than commitments during fiscal years 2006 to 2009. It is also significantly larger (46 percent) than total spending during fiscal years 2002 to 2005, when the City faced similar fiscal difficulties. 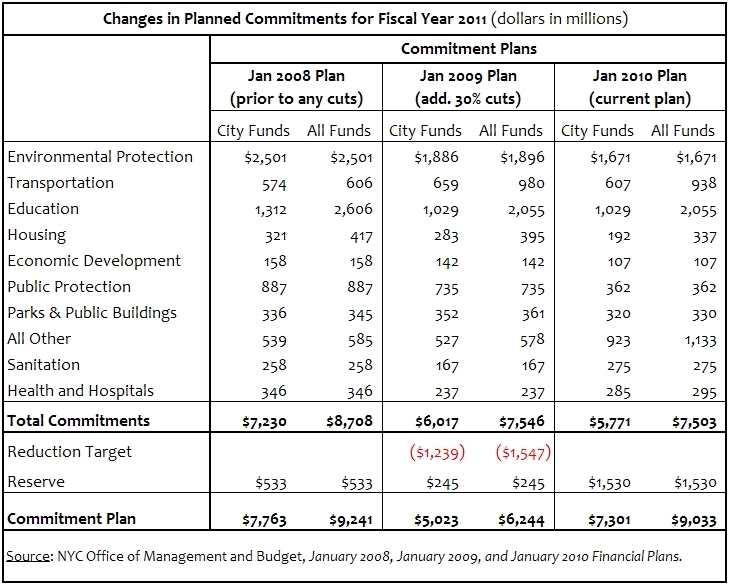 Examining the changes in planned commitments for fiscal year 2011 provides some insight into plans for capital cuts: they are announced, but never quite arrive. In May 2008, when 2011 was still a while away, a reduction in total commitments was announced that was implemented across agencies in November. These cuts totaled of $1.7 billion, a reduction of 20 percent from the level in the previous January 2008 plan. Additional cuts announced in January 2009 brought the commitment plan down to $6.2 billion from $9.2 billion in January 2008 - a reduction of close to $3 billion and 30 percent. Since that time, however, the plan has been revised upward, as $1.5 billion of uncompleted work from prior years is being rolled into fiscal year 2011 and other projects are added. These recent changes effectively negate the previous cuts. While the unforeseen difficulties managing capital projects make some rollovers inevitable and having a reserve is a wise planning tool, the large increase in planned commitments for fiscal year 2011 as it gets closer casts doubts on the intention to lower future capital spending. And if that spending does not come down, debt service will continue to go up. A downsized capital program will be necessary if the Mayor is serious about restraining debt service growth. The same belt-tightening that has occurred with the operating budget should apply to the capital budget, as well. Cuts should be made starting in fiscal year 2011, and should be made with an eye toward abandoning non-essential items, including over $1.0 billion in economic development projects, and preserving key priorities such as repairs of essential infrastructure like roads, bridges, water mains and sewer pipes. Smarter, more targeted investment will also produce real savings in debt service by the end of the Mayor's term.